Using Magento 2 Point of Sale Custom Receipt module, the admin can create customized POS sales receipt for the customers. The admin can design multiple POS sales receipt and assign them to the POS outlets. The admin customizes the receipts like upload logo, add header and footer details and set custom labels for the discount, tax, change, sub-total, cashier etc. And, can even preview the POS receipt. Magento 2 Point of Sale Custom Receipt module is an add-on of Magento 2 POS. So, you should have installed Magento 2 POS module first. This will only work with the Magento 2 POS Version 2.0.6 and above. For POS Marketplace solution, kindly refer Magento 2 Multi-Vendor Point of Sale module. Enable/disable the status of the custom sales receipts layouts. Edit or delete the custom receipts layouts as per the choice. Can preview the receipts layout for the quick view. Assign receipts to the outlet as per their need. 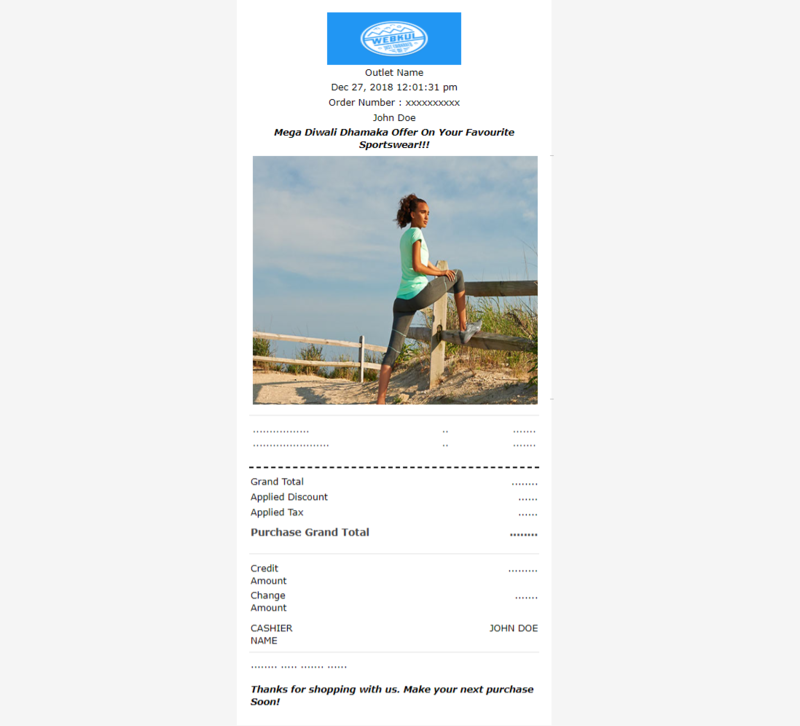 Customize the receipt logo appearance like upload logo image, set logo dimensions etc. Define the content for header and footer section of the receipt. Change default labels for the discount, tax, credit, subtotal, cashier, change etc. For module translation, navigate to the following path in your system app/code/Webkul/PosCustomReceipt/i18n/en_US.csv. Open the file named en_US.CSV for editing as shown in the below screenshot. 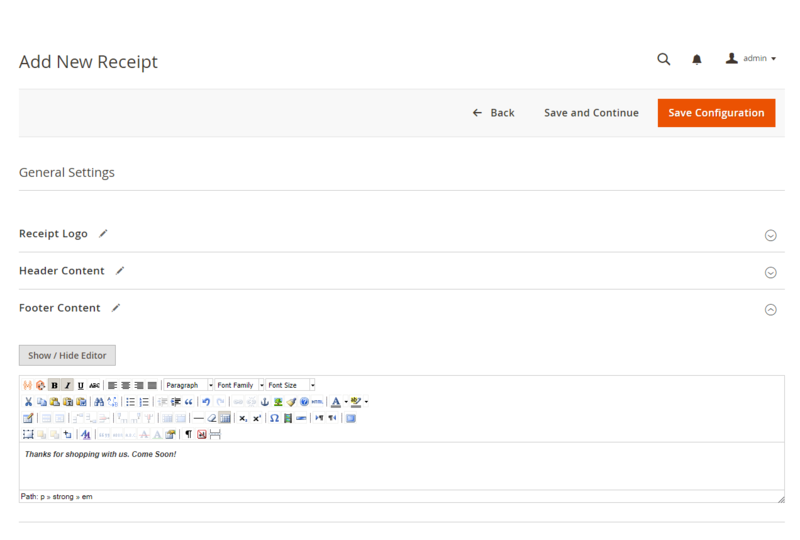 After installing the module, the admin can have a new menu option POS Receipt under the main POS menu section. 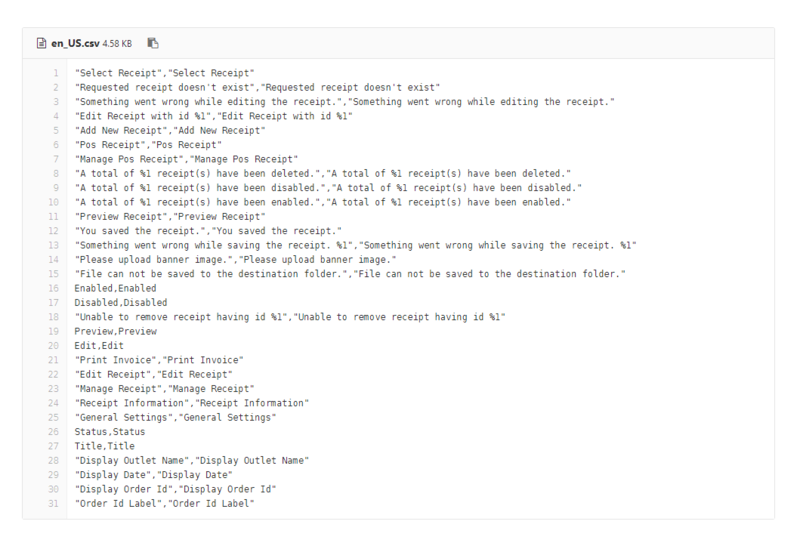 For this, the admin will navigate to POS -> POS Receipt -> Manage Receipt as shown below. 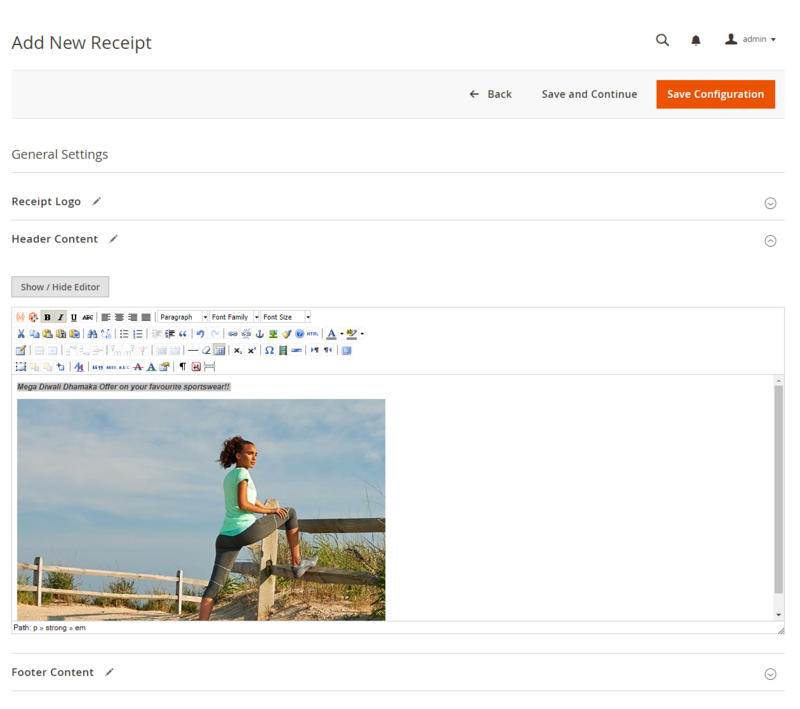 Clicking the Manage Receipt option will navigate the admin to the receipts list page. View the complete list of the existing receipts. Change status of the receipts by selecting Enable/Disable option from the Action drop-down list. Delete the existing receipts by selecting Delete option from the Action drop-down list. Edit the existing receipts by clicking the Edit link. Preview the existing the receipts to have a quick view. Add new receipts by clicking the Add Receipt button. 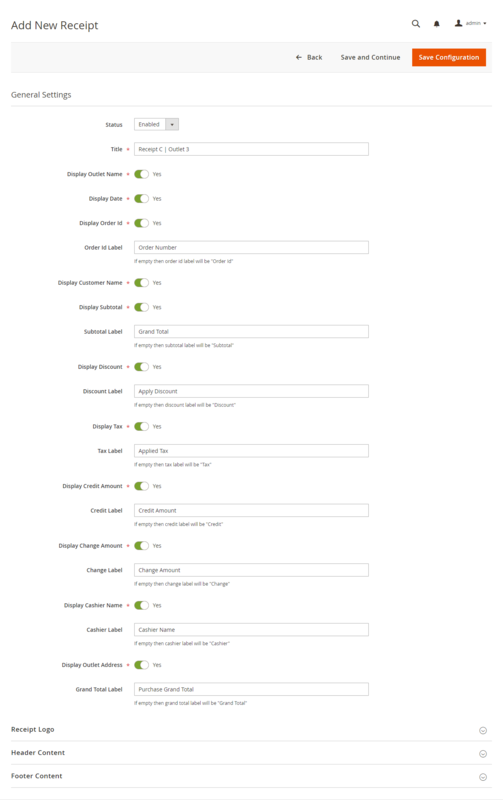 Clicking the Add Receipt button will navigate the admin to the Add New Receipt page as shown below. Status: Enable or Disable the logo status. Title: Set the receipt name. Display Fields: Enable the fields which will be visible on the receipt. Else, disable them. Change Label Names: Set the names of the fields which will be visible on the receipt. Else, the default name will be used for receipt fields. Display Logo: Enable it to display the logo on the receipt. Else, disable it. Receipt Logo: Upload the logo image. Logo Width: Set the logo width as per which the logo will be displayed on the receipt. Logo Height: Set the logo height as per which the logo will be displayed on the receipt. Logo Alt: Define the logo alt text. Define the content for the receipt which will be visible on the header section of the receipt. The admin can even add the images in the content. 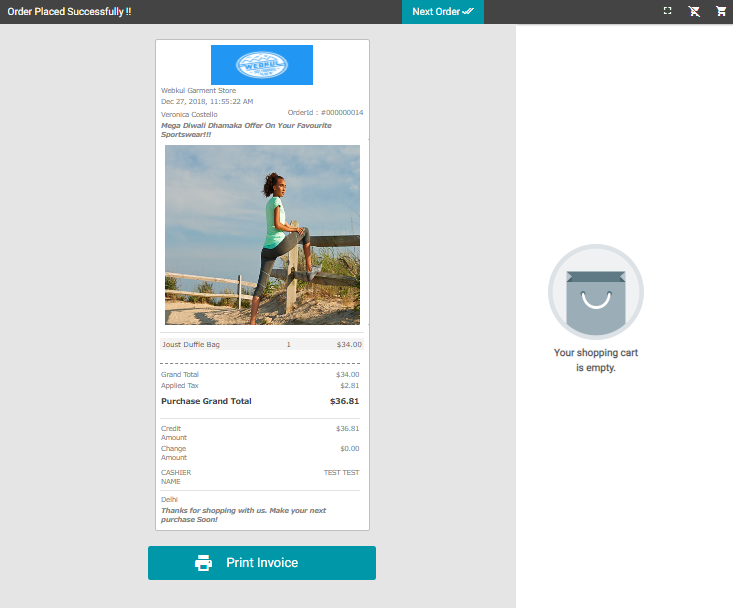 Define the content for the receipt which will be visible on the footer section of the receipt. The admin can even add the images in the content. And, lastly hit the Save Configuration button to save the configuration successfully. 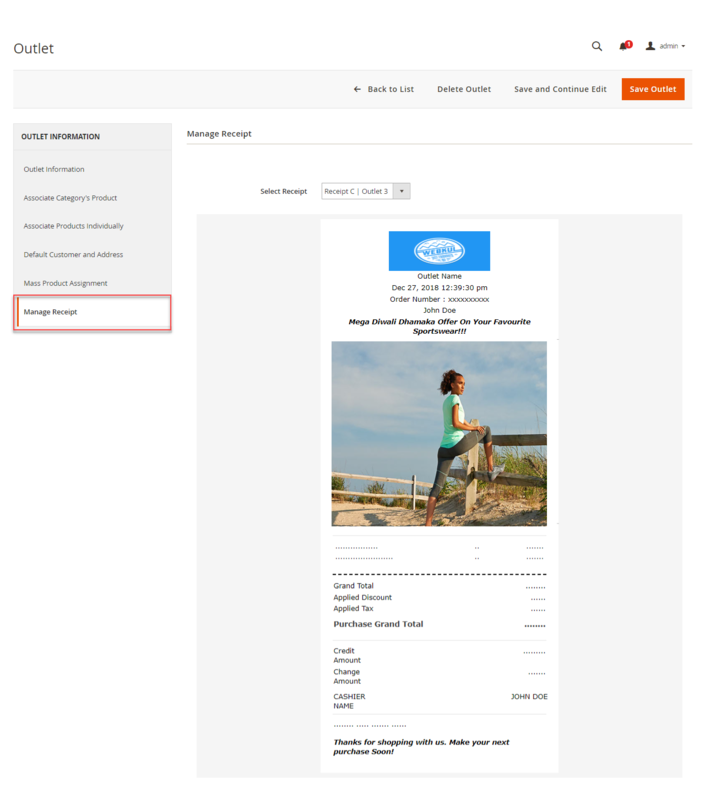 After creating the receipt template, the admin can preview it by clicking the Preview link. The admin will assign the receipts to the outlets. For this, the admin will navigate to POS-> Add/Manage Outlet as shown below. 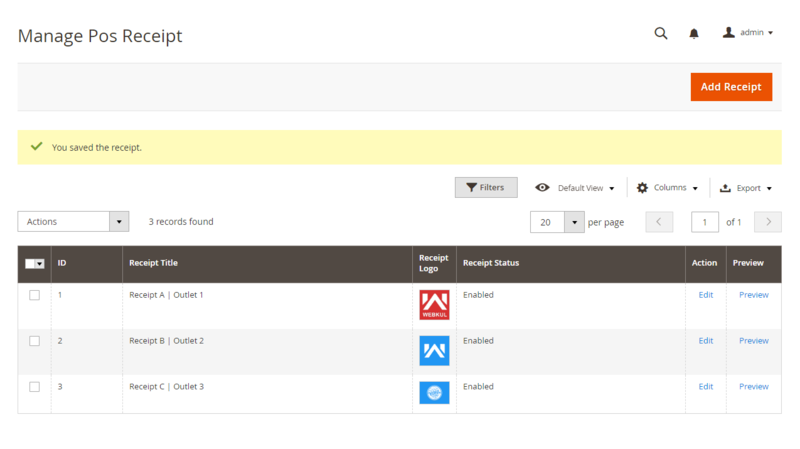 Clicking the Add/Manage Outlet option will navigate the admin to the outlet list page. From the outlet list, the admin will select the outlet for which the admin wants to assign the receipt by clicking the Edit link. This will navigate the admin to the Outlet Edit page. Select Receipt: The admin will select the receipt from the drop-down list and assign it to the outlet. And, lastly hit the Save Outlet button to save the configuration successfully. Now at the front end, the cashier/agent place orders. And, after placing the orders will get the custom POS receipts. The cashier/agent can download these custom receipts by clicking the Print Invoice button.